This is the first time this document has been publicly posted on the internet. This isn't just a datasheet, it's a complete Programming/Technical Reference Manual, weighing in at 67 pages. It's full of hard numbers, tables, and equations. There is a catch however: The manual is in Japanese. I wouldn't hold out for an official version in English. There's a good chance this document was never fully translated from Japanese, even by Yamaha. We've got the information now though. The language barrier can be solved with time and the help of the right people. As you can see, both the YM2612 (OPN2) and YM2608 (OPNA) are part of this line. More significantly, after comparing information about all these OPN chips, and particularly after looking through this new manual, it seems that the YM2608 is the direct and immediate ancestor of the YM2612. More than that, the YM2612 seems to just be a "stripped down" version of the YM2608. The documentation for the YM2608 may in fact be better than an official YM2612 reference, as it contains a description of all the features they removed, while still containing all the information on the features provided by the YM2612. The YM2608 came in a 64-pin package, and required a separate DAC (YM3016) in order to actually produce an analog sound output. The goal of the YM2612 seems to have been to provide a lower cost single-chip solution for systems which didn't require all the features of the YM2608. It seems the parts to get the chop were external I/O Ports, a Rhythm generator with internal ROM samples, a full ADPCM module, and the SSG module (well, most of it anyway ). Apart from the addition of DAC registers at 0x2A/0x2B to provide some basic PCM without the ADPCM module, everything in the YM2612 seems to be unchanged from the YM2608 implementation, meaning the YM2608 manual above should be extremely relevant. Hopefully some of you will find this info useful. I know I will. And now I've got another reason to learn Japanese I hope this gets translated someday, I somehow feel it contains all the answers to the issues I've encountered while writing my sound engine (and I think Steve Snake knows a lot, since he's emulator does emulate ALL the quirks I've encountered 1:1 to real HW). I think that's not quite correct, if you check out the ending sound of MicroMachine96's SuperSonic intro screen, that is totally messed. Gimme a link... so far, all has been 1:1 to my audio-modded MD2 sound. One interesting thing to note about this document is the numbering of the operators. In the Genesis document, we know they've got operators 2 and 3 switched somewhere, either in the register map or in the operator connection charts. Generally, we switch operators 2 and 3 in the connection charts to fix the problem. It's interesting to note from this document however, that the operator numbering in the chart is correct. According to this document, it's the register order numbers which are switched. Notice that the register order is S1, S3, S2, S4. Of course, the two numbering systems are functionally equivalent, it's just interesting to note the "official" order numbers they use. People have problems emulating this or writing games while using it? Thanks a lot Nemesis! You just made my day. I can try to get some of my japanese friends to translate it. I've been trying to get some sound problems in my core fixed without any success but I guess this will help me. This is a huge find. Thanks again. There's quite a bit of stuff in there which isn't covered in the Sega documentation, like self-feedback, conversion to real frequencies, the actual way sounds are generated and operators are combined, etc. 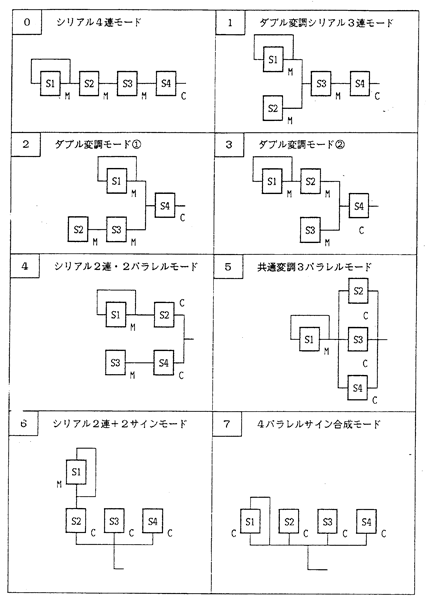 And of course there's lots of misc stuff like SSG-EG and the test register which aren't included in the Sega documentation. Just have a close look at pages 15 and 16. I really wish I could read those pages. 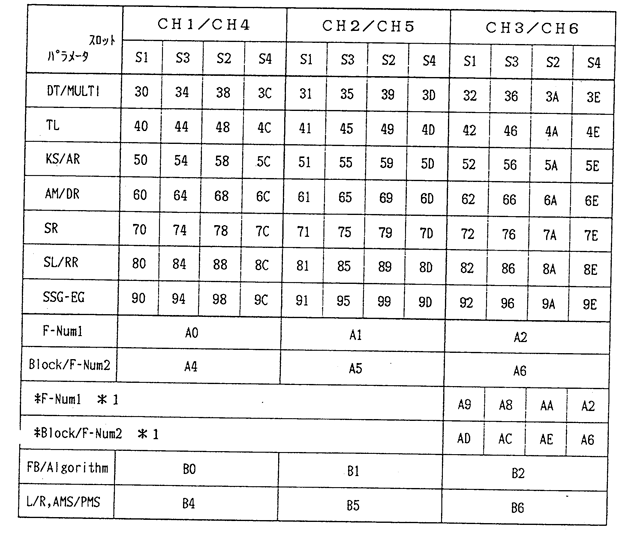 That's the reason this manual is so significant: The FM process seems to be identical between the two chips. As I said, the YM2612 is a "stripped down" version of the YM2608. They cut out extra self-contained modules like ADPCM and simplified its external connections, but it seems they left the FM module untouched. The YM2612 is little more than the YM2608 FM module in a different box. By all means, prove me wrong, but I've looked into this enough now to be convinced of this point, and nothing I've seen in the documentation so far suggests otherwise. SSG-EG - A proprietary register whose usage is unknown. It should be set to zero. That seems to say to me quite clearly that the people writing this manual simply didn't know what it was for. I'd say that information either wasn't passed on from SOJ to SOA, or it wasn't passed on from Yamaha to SOJ in the first place. This idea of SSG-EG being "buggy" in the YM2612 seems unfounded to me. I don't know where that rumor came from, but I've certainly never seen a case presented, or even a case mentioned, where SSG-EG has been seen to play up. It's quite possible they were officially "unsupported" features of the chip (IE, they were only included because it wasn't worth removing them), but in terms of being buggy, I'm not convinced of that at all. Yes, it really doesn't make a difference what they're called or how they're numbered. I just find it interesting to know how they designated them. I like to use the "official" names and designations for things where possible. YM2413 is a OPLL, cut-down and very limited version of OPL1. It's different family, so of course information about this chip can't be used for YM2612. YM2149 is a slightly enhanced clone of AY-3-8910, it's not FM synth. It's quite simple and very well documented PSG chip. YM2203 has it as addition to FM part. FM part of OPN family chips is compatible in general (at least between YM2203, YM2610, YM2612), so documentation for any of chips of this family can be useful. Shiru is right. You can't use YM2413 info for YM2612 as it is different. I hope this manual contains those little details that I am looking for. First of all SSG-EG sounds different on all emulators so there is something that needs to be corrected here. Secondly there is the CSM key control which nobody seems to have a clue about. Thirdly I recently discovered (by listening to real hardware recordings and emulated sound) that in 3 slot mode, channel 6's envelope generator seems to speed up. I maybe wrong but this fixes sound in some games. BTW, I was told that Dune's soundtrack called 'Ammons Advice' doesn't sound correct in Kega either. Can't confirm it though. Channel 3 can set the mode by $27 “D7,D6". That last row is probably suppost to be for bit patterns 10 and 11, but I've written it exactly as it appears in the document. attacking it, and it changes in the straight line at other rates. Does anyone emulate this correctly?